This colossal granite door frame was seen in the ancient capital of Anuradhapura. 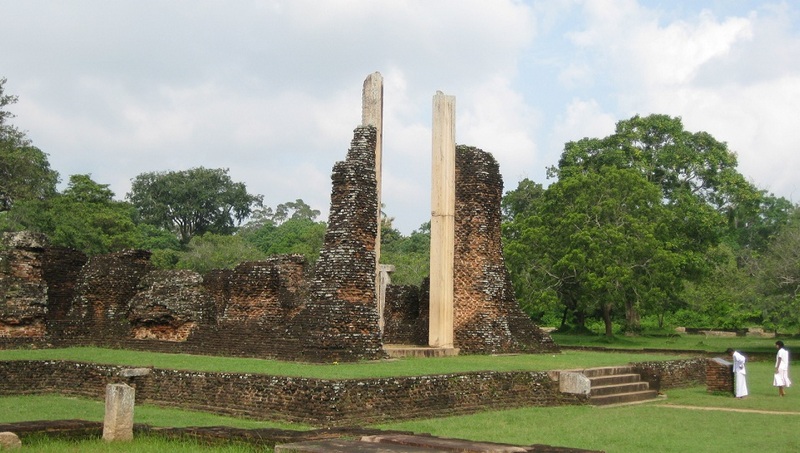 Anuradhapura is a UNESCO World Heritage site and it has thousands of ruins scattered in an area as large as 40 square kilometers, belong to the period from 4th century BC to 11th century AD. This particular building must have built over one thousand years ago as it belongs to the latter Anuradhapura period. what beautiful ruins. it seems well preserved to be out in the elements for as long as it has been. i'm sure there's some history behind this too. hope all is well. I checked out almost everything that I missed. Sorry for not commenting on any of your posts for a while. Was crazy busy during the past few weeks. The walls were made of bricks and partly destroyed, the roofs were made of wood so you can't even see a trace of it now. But the granite part is preserved. This particular building was used as an image house - to keep statues of lord buddha. Good to see you after sometime. No worries, glad to see you back and hope to see more photos through your new camera. You truly live in the land of the giants. Wow what a fantastic old ruin! Great shot of it. That must have must have been an impressive structure, it still is amazing! Nice one,hope you would post more like that! fascinating design. amazing place to visit. That is some door frame. There must have been giants in Sri Lanka centuries ago (LOL). Seriously, this is a beautiful ruin and I'm glad it has been preserved. thanks for sharing this wonderful place, am glad it has been preserved, and your shot is beautiful. This particular building must have had a large scale statue inside. So as you said this huge doorframe could have been the entrance so those who enter the building could see the entire statue clearly. Yes, I’ll upload more archaeologically important places in the future. Yes, it is a great place to visit. Yes, you cannot cover the entire site in one visit. It’ll take months to visit all the places in old Mahamewna Garden and beyond. Yes, there are lot of preservation is going on here, but may be we could have done more. Anyway it is a great place to visit. When ever I visit Anuradhapura or Polonnaruwa, I am always awestruck. I drift in to dreaming about those builders and engineers. I have visited Anuradhapura many a times but I do not recall seeing this structure. Would you mind telling us where is this located. I will make sure to visit next time. This is located close to Jethavana dagabo. Usually Mahamewna Uyana ( belongs to Ruwanweliseya/Thuparama) and the surrounding area is always green although it is situated in the dry zone. For me it is one of the most beautiful man made gardens. Even Abhayagiri area looks the same eventhough it is out of the limits of Mahamewna Uyana. You get a feel for the height when comparing the two figures on the right. It must have been an amazing site in its heyday. Yes, it must have been an amazing structure those days. At least I'm glad this much is preserved at present. Thanks very much! This is an image house (Something like 'Gedige') used to keep a buddha statue. The statue is no longer there but it must have been 7-8 metres tall. The large door frame is used to show it clearly for the devotees who enter the shrine room. What an impressive architecture. The high gate with the two jambs.